This year we were blessed with fantastic weather – and weren’t we due it? 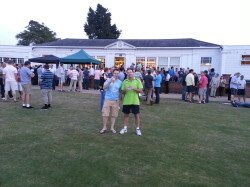 The week started on Friday 5th July in the evening with an Old Oaks game against principal sponsors Savills and a barbecue. 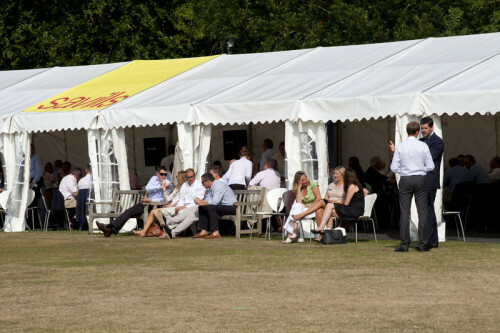 Off the field, we are delighted that we also partnered with Sevenoaks Lions again to stage the Sevenoaks Beer Festival and at the same time help to raise money for their charitable work. 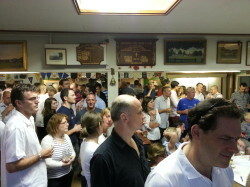 The crowds were amazing over the three days of the beer festival helped by some Wimbledon tennis on the TV and excellent cricket on The Vine. 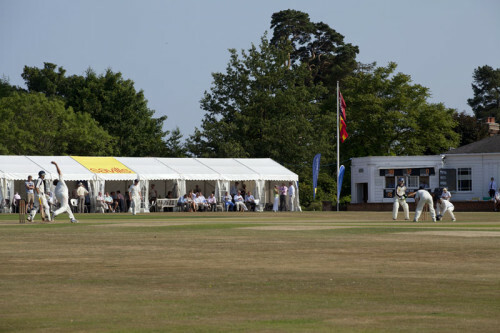 On Monday SVCC played Lloyds of London, with The Vine chasing (and getting) 254 to win we had three players in the 60s, James Day, Miles Richardson, Callum Watson. So a great start to the week. 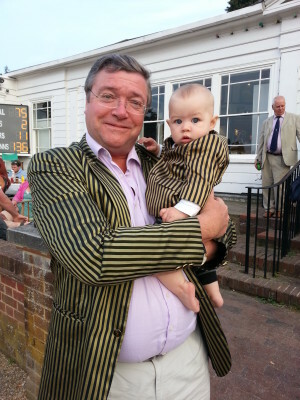 On Tuesday we played the AKCC in another close fought game in which Miles Richardson got a fine 70, this time going down to a 6 off the last ball of the day bowled by Mike Thompson. After that there was a demonstration of visually impaired cricket by the KCB with many youngsters joining in. 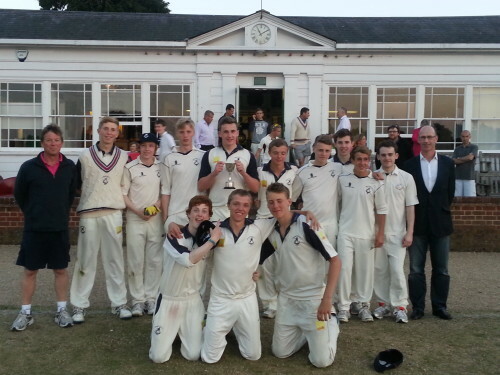 In the evening the U17s won the Polhill Trophy from Holmesdale; Will Canniford seen here holding the trophy with Team Manager Mike and Junior Chairman Tim Bevan Thomas. 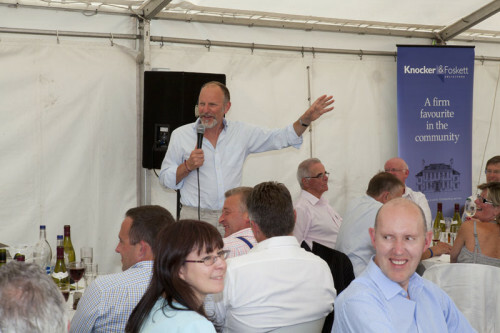 On Savills’ Wednesday we played the MCC whist Simon Evans entertained the 140 lunch guests. 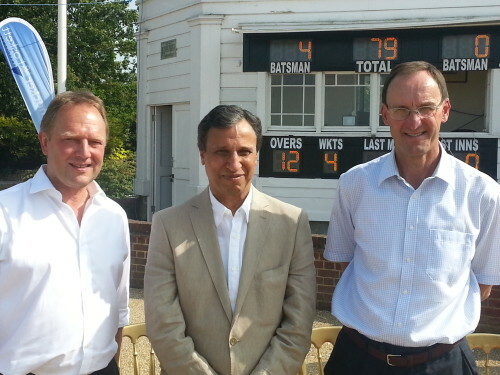 In the big match, the MCC batted first and scored 268 all out, in which Alex Rayner took 5 wickets and Mike Thompson took 4. 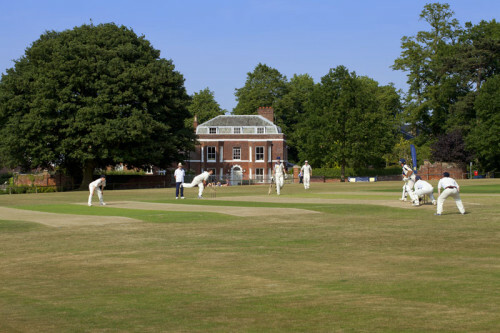 SVCC replied with 215-9 with Luke Blackaby scoring 51 before chipping to mid on, Alex Rayner rounded off an all round performance with 45, and James White gamely hung on for a draw at the close of play. 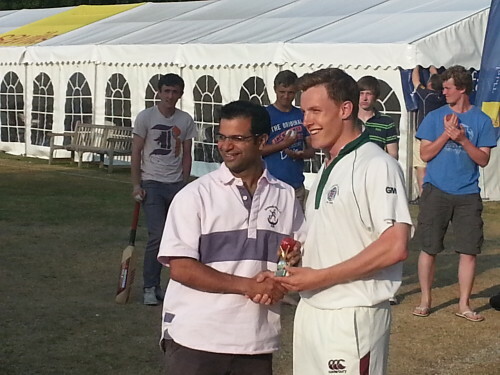 On Thursday in the the 6 a side tournament, OTs won a high scoring final scoring 74, which proved too much for SVCC who ended 8 runs short; Olly Durrell was player of the day. 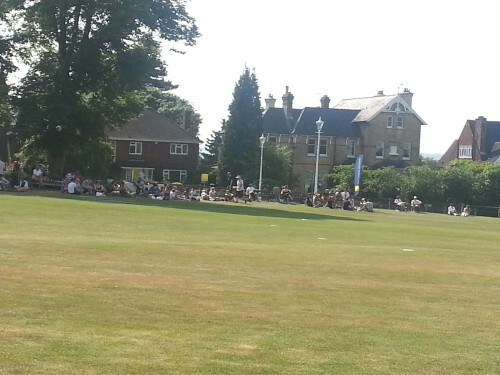 Our thanks to all who participated, particularly the schoolmasters from Sevenoaks School playing as Orbilians. On Friday we played Singapore CC and SVCC batted first; in 42 overs we got 238-8 after a shaky start, with Luke Blackaby scoring a fine 140* and James White 40. Being generous hosts, Singapore CC had 2 extra overs and were also 238-8, the ever-green Bruce Leeke taking 4-40, Luke Blackaby rounding off an excellent game with some adroit death bowling of 3 overs for 5 runs including 1 off the penultimate over when they needed only 9 to win – draw scores level. Told you I like that jacket! 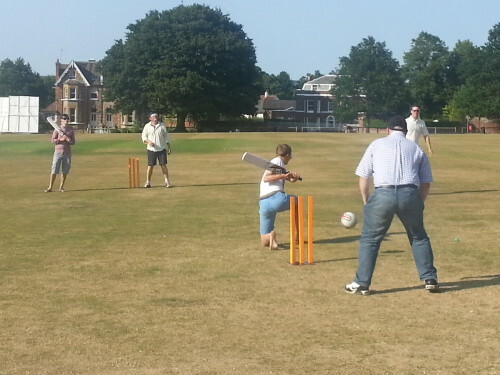 In the evening Old Oaks played a KVCL XI which OOs won. 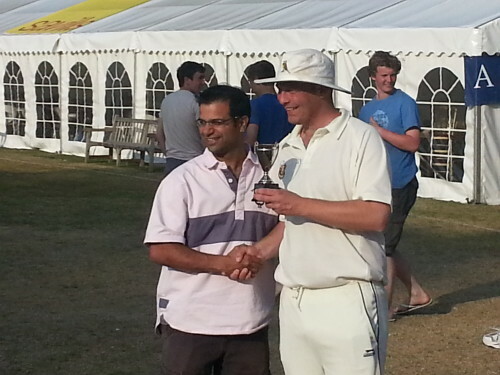 Batting first, the Vine scored 134, with a notable contribution from Bill Saker of 25* and some tight bowling restricted KVCL to 110. 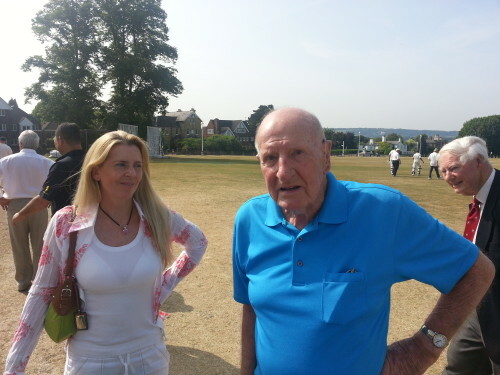 During the day, the Kent Legends lunch included a surprise visit from Jack Stead in his 94th year and impromptu reunions with some names from the past including Peter Williams to who he was vice captain. 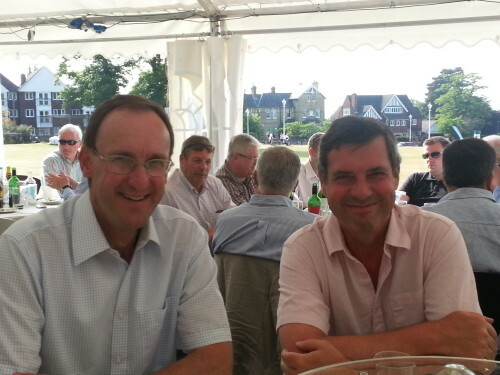 Our Kent Legends this year were Asif Iqbal, Chris Tavaré and Paul Downton who captivated the audience with tales of Daring Do for an hour; we are indebted to Asif, Chris and Paul for their time and candour. 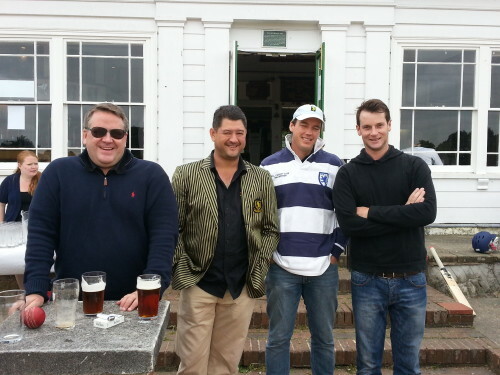 and not forgetting the SVCC members themselves and our guests.